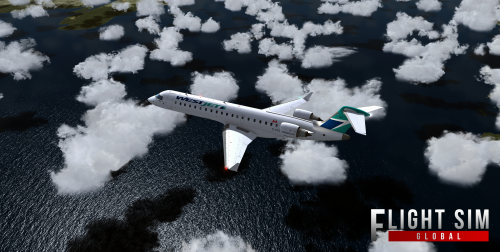 We have just released our newest repaint for the Aerosoft CRJ700ER, WestJet! This is a fictional livery, that does not exist. I made this as a request, and for fun to imagine what it would look like if WestJet operated CRJ’s in the future. Currently the repaint was just tested in P3Dv4. WestJet was founded in 1996 by Clive Beddoe and a team of like-minded partners, who believed that just because you pay less for your flight, doesn’t mean you should get less. Armed with that philosophy, three aircraft, five destinations and 220 friendly WestJetters, we began our journey — a journey that would help us become a company of more than 12,000 passionate WestJetters flying our fleet of Boeing 737 Next-Generation aircraft to more than 100 destinations across our network. Our continued efforts toward responsible growth consider our impact to the environment, to the communities where we fly and to and the people we reach on a daily basis. Thanks For Downloading this repaint by Flight Sim Global!